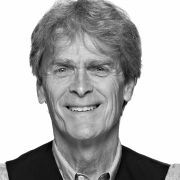 World-renowned creator of legendary ad campaigns for Levi's, Lego, and Audi, among others, Sir John Hegarty is Chairman & Worldwide Creative Director of Bartle Bogle Hegarty (BBH) where he presides over one of the most successful and creatively acclaimed agencies. Sir John started in advertising as a junior Art Director at Benton and Bowles, London, in 1965. He almost finished in advertising 18 months later, when they fired him. He joined a small 'going places' Soho agency, John Collings & Partners. They did - out of town. In 1967 he joined the Cramer Saatchi consultancy which became Saatchi & Saatchi in 1970, where he was a founding shareholder. One year later he was appointed Deputy Creative Director. Sir John left in 1973 to co-found TBWA, London, as Creative Director. The agency was the first to be voted Campaign magazine's Agency of the Year in 1980. He left in 1982 to start Bartle Bogle Hegarty. Four years later in 1986, BBH was also voted Campaign's Agency of the Year, and won the title once again in 1993. In addition, BBH became the Cannes Lions Advertising Festival's very first Agency of the Year in 1993. It also won the title again in 1994. Throughout BBH's two-plus decades, Sir Hegarty has been responsible for numerous accolades for the agency. Among his abundant award show honors, Sir Hegarty has taken home over 15 Clio's alone, and his Levi's 501 work is in the Clio Hall of Fame. since its inception in 1982 BBH has been named Agency of the Year more than six times, most notably by Campaign magazine, who also named BBH as their first-ever Network of the Year in 2004, Cannes, and others. Sir John's credits include Vorsprung Durch Technik for Audi, and Levi's' Bath and Launderette. His awards include two D&AD Golds and six Silvers, Cannes Golds and Silvers, and British Television Gold and Silvers. More recently, he was awarded the D&AD President's Award for outstanding achievement in the advertising industry and chaired the 1999 New York Art Directors Advertising Show.